1. I wrote my second book. When I was asked in 2011 whether there would be a first book, my answer was no. Life rearranged itself and someone suggested that it happen, and 2012 brought forth Drink & Tell: A Boston Cocktail Book. 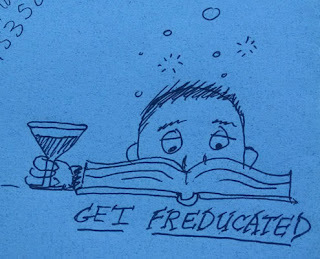 I am not sure whether the book did more to propel the Boston Cocktail scene forward into the eyes of the world or alter my career path into being a professional bartender in 2013. Similarly, if you asked me in mid-2016 whether there would be a second book, the answer was no. However, as I contemplated life while flying out to Tales of the Cocktail in 2016, I decided that I ought to try to get a second edition out the following year for the 5th anniversary. From November to April, I spent 20-25 hours per week on top of a full time bartending job (and not counting the previous hours amassed with recipes and essays before that) to get Boston Cocktails: Drunk & Told into press. This book had more recipes (no repeats) and more essays than the first book, and it represented that the cocktail book that I wanted to buy myself now (whereas the first book was the one I would want to buy myself in 2012). 2. Gave a talk at Tales of the Cocktail. This year I checked off another item from my bucket list which was giving a Talk at Tales; previously, I had given talks at various events with the largest one being Portland Cocktail Week. This talk was about drinks during the Colonial period, and I presented alongside Wayne Curtis, Warren Bobrow, and Brian Maxwell. A lot of what I talked about was how to incorporate old drinks and old drink ingredients into a modern menu and get bar guests excited about it through my work at Loyal Nine. A summary of the talk can be found here. After opening Loyal Nine and being promoted to lead bartender a few months later, things had run their course after two and a half years. In between, I helped the Cocktail Lab at Earl's Prudential get off the ground by being one of the first resident bartenders in October and November; for each shift, I created 3 new drinks every week for my menu and each one utilized a different key ingredient ranging from nasturtiums to cantaloupe. And at the end of November, I started training at Our Fathers Restaurant, Bar, and Deli which opened in early December. Besides the shifts at Earl's, I also did a guest shift at Backbar in late Spring that was a lot of fun. 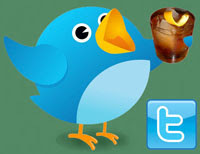 As you can tell, the Cocktail Virgin blog is still going with over 400 posts this year even with my writing of a book that took up a lot of my time. 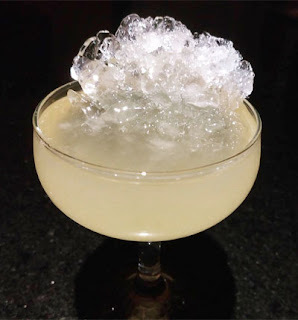 I have also been writing a monthly post for the US Bartender's Guild site; while a good number of them are only accessible to USBG members, many are visible on their external site. I have also had a few articles published on the Tales of the Cocktail site including the history of the Daiquiri Time Out and recipes for the Rougarou Daiquiri and the Lost U-Boat. Moreover, I was asked to write another entry for the Oxford Companion to Cocktail and Spirits to add to the one I wrote in 2015. 5. The reading train continues to run. 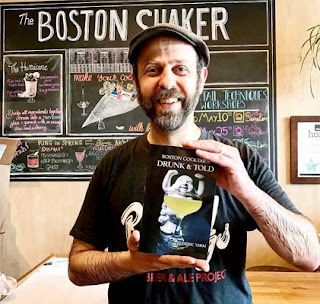 The book scored some press in the Massachusetts' Beverage Business and BostonInno amongst other places, as did my involvement with Earl's Cocktail Lab in BostonMagazine. I also had recipes in HGTV about the Piña Colada and my thoughts on the Hot Toddy in MEL Magazine, and I got interviewed on BostonChefs in their "Service Bar Chat" series. This past January found me in Louisville, Kentucky, where I was working the back end of the American Craft Spirits Association's judging competition that was being run this year by Privateer's Maggie Campbell. In exchange for working the event, I got my hotel and most of my meals taken care of. It also allowed me to interact with a good number great bartenders/bar owners, distillers, and brand ambassadors who were judging and meet the other bartenders who were working the event; moreover, I had my nights free to drink up Louisville both of its bonded Bourbon, its beer, and its cocktails. July found me back in New Orleans for Tales of the Cocktail. I was considering skipping it to do other events, but the offer to give a talk (see #2) was too great to pass up. 8. 2017: The Year of the Boat. This year I found myself on a boat several times for various bartender and liquor events. Five times in fact. Two were with the Boston USBG chapter with one being a kayaking adventure up the Charles and the other being a trip to George's Island for old fort exploration and a picnic. The other three were brand related. There was a Mount Gay rum tasting with master blender Allen Smith while sailing around the harbor in a decent sized boat, a trip to gather dinner on a lobster boat during a Dewar's Scotch ramble, and an adventure to another harbor locale dubbed "Jäger-Island" for the day. • Lili'uokalani's Downfall and Yucatan Bird as my riffs on the Missionary's Downfall and the Jungle Bird, respectively. • The Diamond Queen as my entry into the Tales of the Cocktail Martini competition. • Caustic Negroni and Negroni on Saturn as my Negroni Week drinks -- one created on the fly by request and the other a mashup with the gin Tiki drink the Saturn. • Tomb of the Caribs as a 'Ti Punch riff. • Oaxacan Smash, a Phil Ward-inspired number that I served as drink of the day at Loyal Nine and on my first menu at the Cocktail Lab at Earl's. Another Smash that I was proud of was the Cornerman as a riff on the Prizefighter. 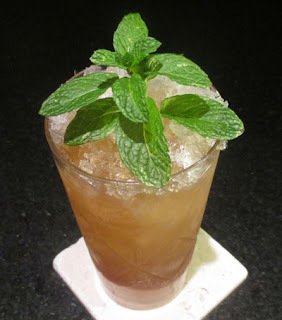 • Lastly, the Gunwale Punch influenced by Trader Vic's Gun Club #2, Havana Cocktail, and other drinks. 10. I always have problems figuring out the last one. This summer were the duo milestones of 9 years blogging here and 11 years of cocktail writing in general. It was a pretty productive year for blogging with a little over 400 posts for 2017. Sadly, this year found me burying Mixology Monday after 116 events spanning 11 years but not without giving it a proper Irish wake (read what the cocktail blogosphere had to say as its last words to a fallen hero). My Instagram account is still doing well with around 3500 followers and images (with recipes) going up almost daily; it is sort of a parallel to the blog but with less commentary. I have no clue what 2018 will bring for me. I am looking forward to "Tiki the Snow Away" on Instagram in January, but past that, I will have to figure it all out. So let us raise a glass to 2017. Cheers and thanks for reading along this year! Stir with ice, strain into a cocktail coupe, and garnish with lemon oil from a twist. 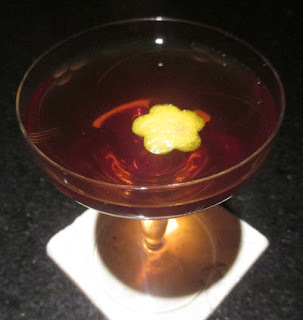 For my first drink at Estragon, I asked bartender Sahil Mehta for his previous shift's drink of the day, and he replied that he thought the combination would appeal to me when he created it. Perhaps Sahil has picked up on how Bonal, Benedictine, and Cynar are some of my favorite ingredients. Sahil explained that he added Scotch here for heft which is something that I have noticed can work well in gin drinks such as in the Automobile, and he added Cynar to the mix when he found the balance too bright. As the drink was nameless, when Sahil mentioned that this cocktail reminded him of smoky jazz bars and bootleggers, and I recommended the name the Lighted Lamp after a Boston Prohibition-era speakeasy. The Lighted Lamp greeted the nose with a lemon oil and grape aroma, and Bonal's grape continued on into the sip. Next, the swallow began with gin's botanicals as well as funky herbal flavors from the Benedictine and Cynar combination and ended with Scotch notes and Bonal's quinine. Overall, the swallow was rather rounded perhaps due to the Benedictine in the mix. Shake with ice and strain into a cocktail coupe rinsed with a peaty Scotch. Two Mondays ago, Andrea and I ventured down to Estragon for dinner. For a first drink, Andrea requested a prior drink of the day that bartender Sahil Mehta described as his riff on the Paper Plane. 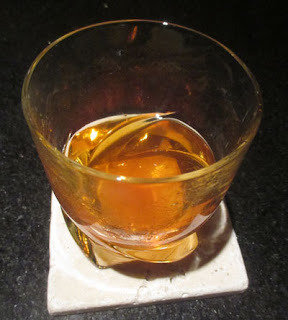 Instead of the lighter and fruity Aperol, Sahil opted for the more burly Green Chartreuse, and to bolster the Bourbon, he added a touch of smoky Scotch. For a name, he dubbed this one after another of M.I.A. 's songs, Double Bubble Trouble. In the glass, the Double Bubble Trouble proffered a smoky nose accented by the Chartreuse's herbal notes. Next, lemon, orange, and malt flavors with a hint of caramel on the sip transitioned into light Bourbon notes leading into an orange-herbal element with a thyme-like finish. Stir with ice, strain into a cocktail glass, and garnish with a cherry. 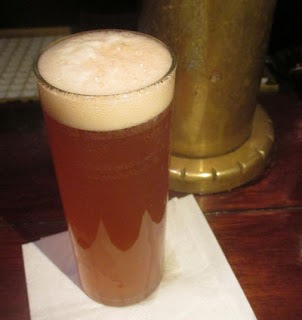 Two Sundays ago, after seeing a reference to a Red Hook riff on Reddit, I decided to seek out the history of this drink called the Meat Hook. On the BarNotes app, drink creator Shaun Layton posted that it was "inspired by the Red Hook, finished with a little Islay whisky" that he created at L'Abattoir in Vancouver. This recipe was slightly less adaptable than the one provided by Scout Magazine (listed above) that was easily scalable from metric into ounces. 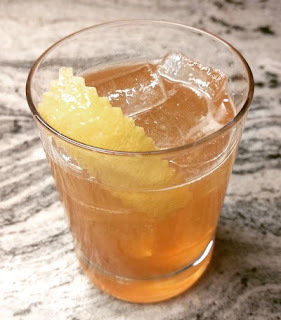 Both recipes listed Wild Turkey 101 without revealing whether it was the Bourbon or the rye, but a Reddit user supplied the clue that he had it served to him at the restaurant with Rittenhouse Rye when they ran out of the Wild Turkey. The Meat Hook gave forth a peat smoke aroma along with a hint of fruit from either the Punt e Mes or the Maraschino. 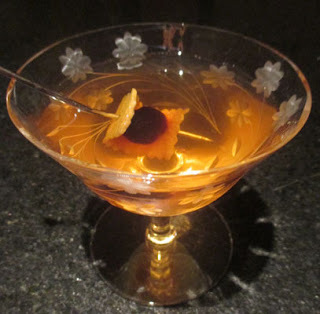 Next, a grape and malt sip was followed by rye's spice, Scotch's smoke, and Punt e Mes' bitterness on the swallow with Maraschino's nuttiness rounding out the drink on the finish. The extra lift from the peaty Islay whisky certainly set this Red Hook riff in an unique direction. Stir with ice, strain into a rocks glass with a large format ice cube, and garnish with a lemon twist. 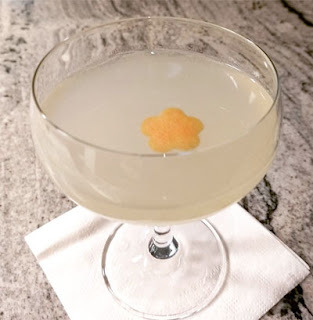 Two Saturdays ago, I was seeking a nightcap after returning home from my shift at work, and I sought out one in New York Cocktails. There, the Analogue from the Manhattan bar Analogue seemed like it would fit the bill with its somewhat Old Fashioned-like structure. 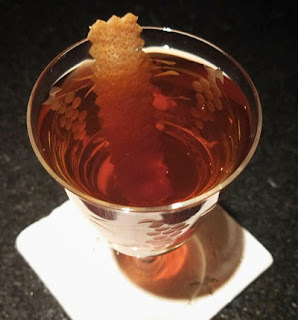 The book described how the bar staff was trying to develop a Bourbon drink for an Autumn menu, and when the winning result tasted like they thought the bar itself would taste, they named it after their establishment. 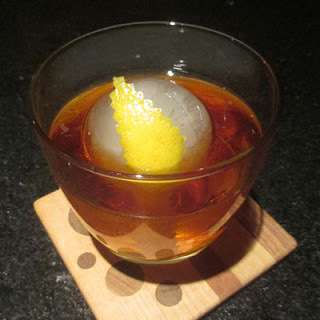 Once in my glass, the Analogue presented a lemon, dark rum, and allspice bouquet to the nose. Next, caramel from the dark rum filled the sip, and rum, ginger, allspice, and clove rounded out the swallow. For a Bourbon drink, the drink as I made it did not come across much as a whiskey cocktail, but perhaps a less flavorful dark rum would allow the Four Roses to shine here. Stir with ice, strain into a double old fashioned glass, and garnish with grapefruit oil from a twist. After my second bar shift at Our Fathers Deli two Fridays ago, I stopped into Russell House Tavern on my way home. There, I found a seat in front of bar manager Joe Slavinski and asked him for the Deadbolt. Joe described how that was his menu item; he was inspired by a similar drink he had once read about in one of his books but could never find again, so he made his own take on it. His cocktail was first crafted with the original Cynar before being put on the menu with Cynar 70, so Joe explained that either version would work well here. The Deadbolt teased the nose with smoke and dark notes from the Cynar that were brightened by the grapefruit oil. Next, malt and caramel on the sip led into a swallow where smoke transitioned into funky herbal flavors with a chocolate and lime-clove finish. Stir with ice, strain into a rocks glass rinsed with Green Chartreuse, and garnish with lemon oil from a twist. Two Thursdays ago, I reached for the 2012 edition from the Food & Wine: Cocktails section of my drink book library. There, I was lured in by the Lord Bullingdon's Revenge by Mike Ryan of Chicago's Sable with a similar whisky, chocolate, and Chartreuse trio as in the Flushing--Main Street. Mike was inspired by William Thackeray's The Luck of Barry Lyndon as well as Stanley Kubrick's movie version to name this whisky Old Fashioned after it. In the story, Lord Bullingdon shoots Lydon in the leg during a duel, and "the Scotch echoes the smoke from the old-style pistols they used, [and] Chartreuse represents the medicinal herbs used in the poultice for Lyndon's leg." Lord Bullingdon's Revenge reached the nose with bright lemon oil, peat smoke, and Green Chartreuse's herbal aromas. Next, the malt sip stepped aside to smoky Scotch and chocolate flavors on the swallow with a smoke, cinnamon, and clove finish. Frappe with 3 celery leaves (Muddle celery leaves in gin. Add the rest on the ingredients, stir with ice, strain into a cocktail coupe, and garnish with a fresh celery leaf). While flipping through the 2016 Waldorf Astoria Bar Book two nights before, I had taken note of the collection of Salome cocktail recipes that the author had collected. 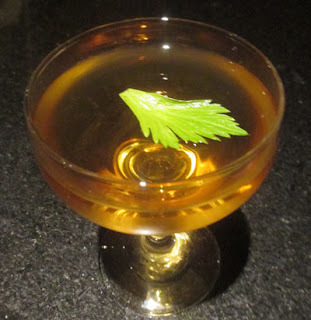 The celery leaf one from Jacques Straub's 1914 Drinks book seemed more interesting than the gin-dry vermouth-Dubonnet one that ended up in the Savoy Cocktail Book, so I hunted out the original in my MuddePuddle reprint of Straub. In the glass, the Salome shared juniper and orange aromas that gave way to a grape-driven sip. Next, the swallow presented gin complemented by vermouths' herbal notes that finished with gentle celery flavors. Two Mondays ago, I was flipping through the pages of Pioneers of Mixing at Elite Bars: 1903-1933 when I spotted the Platoon that appeared like a split spirits Liberal Cocktail. The Pioneers book has a few drinks that mirror this format such as the rye over rum Yankee Skipper and the Scotch over applejack Sunshine. Here, the structure was Scotch over rye, and that seemed like it would make for an intriguing nightcap. Once stirred and strained, the Platoon shared a peat smoke and dark orange bouquet to the nose. Next, grape and malt on the sip transitioned to smoky Scotch and rye spice on the swallow and a pleasantly bitter orange finish. Shake with ice, strain into a cocktail glass, and garnish with an orange twist. Two Sundays ago, I reached for Frank Caiafa's 2016 The Waldorf Astoria Bar Book. There, I paused on the Money Margarita that was a mashup of a Mezcal Margarita and a Monkey Gland which they crafted at the Waldorf Astoria's Peacock Alley bar. The idea reminded me somewhat of Phil Ward's tequila Monkey Gland that he dubbed the Glandula del Mono. Once in the glass, the Monkey Margartia proffered an orange, smoke, and anise aroma. Next, orange with a hint of lime and berry notes filled the sip, and the swallow gave forth smoky agave and orange flavors with an absinthe and lingering smoke finish. Build in a Pilsner or Hurricane glass (Collins), fill with crushed ice, and swizzle to mix and chill. Top with crushed ice, and garnish with 2 dashes Angostura Bitters, 2 dashes Peychaud's Bitters, and a mint sprig. After having our Tom & Jerrys followed by dinner, I was in the mood for something warmer in thought (but colder in the glass) to deal with the snow. Therefore, I turned to New York Cocktails book where I stopped on Jason Littrell's Swizzle, Behind God's Back, that he crafted at Dram circa 2010. The recipe came across like a Cuban Anole with pineapple and a swizzling step in the mix, so it felt worth suiting up to see if my mint patch was still alive. 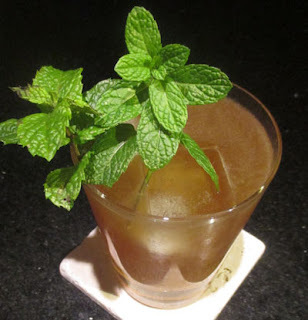 After kicking off a layer of snow, my mint looked as good as it did when I made the Lili'uokalani's Downfall, so it was time to make this drink. Behind God's Back gave forth a mint, clove, cinnamon, and anise bouquet to the nose. Next, lime, pineapple, and the rum's caramel notes filled the sip, and the swallow continued on with more rum and pineapple flavors joined by the orgeat's nuttiness and a cinnamon-laden finish. With the first snowfall of the year two Saturdays ago, Tom & Jerry season was officially on. There was a tradition started pre-2008 at No. 9 Park that Tom & Jerrys ought to only be served on snow evenings, and John Gertsen became the spokesperson to give the thumbs up as to whether it was time to whip up this old 19th century drink. John took that right with him to Drink and broadcasted the message on Facebook (people would seek his approval to see if was time), but alas, he had to relinquish that role when he ventured West to San Francisco. 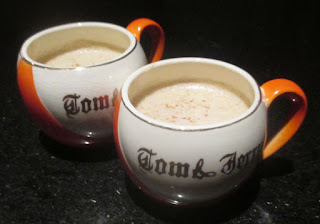 Every year, I try different spirits or combinations to mix with the batter and hot milk that can range from seemingly normal like a blend of aged Calvados and dark rum to the absurd such as the all Angostura Bitters Tobago & Jerry. While Scott Holliday introduced us to the Fernet & Jerry, I came up with the Cynar & Jerry on the same night that I tinkered with Smith & Cross rum in the mix. For this snow squall, I brainstormed up a half dozen ideas, and Andrea voted on which two she preferred the most: the Tom & Jerry Alexander (left) and the Negroni & Jerry (right). Build in a pre-warmed small mug, stir to mix, and garnish with freshly grated nutmeg. The Alexander version gave forth a rather chocolatey aroma accented by nutmeg spice. Next, a creamy and rich sip shared some dark notes from the cacao, and the swallow showcased pine, chocolate, nutmeg, vanilla, and allspice flavors. The Negroni version, on the other hand, was mostly nutmeg spice on the nose. Next, the creamy rich sip had a hint of grape, and the swallow displayed the Campari's bitter orange along with juniper-pine, clove, and other spice notes. Between the two, the Alexander one was the clear winner. The Negroni one was tasty, but it did not fully capture the essence of the drink but instead muted and transformed it; then again, my original thought was to use all Campari before I tempered it down to the three equal parts recipe. Two Thursdays ago, I selected the Pioneers of Mixing at Elite Bars: 1903-1933 cocktail book for the evening's nightcap. There, I found the Grandstand that reminded me of the brandy version of the Chauncy Olcott. Once prepared, the lemon oil from the twist I added brightened the aroma of the nutty grape on the nose. Next, grape from the sherry and vermouth filled the sip, and the swallow continued on with Cognac followed by nutty flavors as well as spice notes. Shake with ice, strain into a cocktail coupe, and garnish with a cocoa-cinnamon dusted dehydrated orange wheel (an orange twist would work in a pinch). 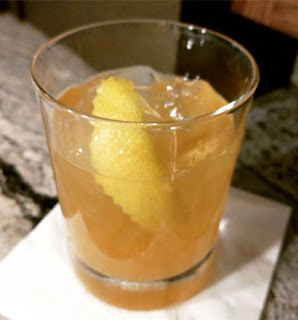 Two Wednesdays ago, I was unable to attend the Bacardi Legacy Boston competition earlier in the day but I was able to try Carlo Caroscio's entry, the Gold and Ash, that night for Backbar put it on their menu. 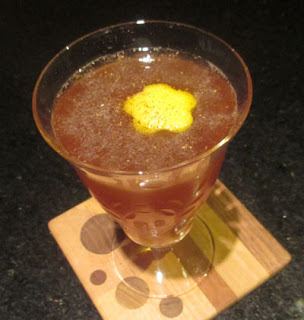 The combination of Averna and cinnamon is one that has worked well in drinks like the E.C. Cobbler and both ingredients individually pair well with chocolate, so I requested bartender Lindsay Adams to make me one. 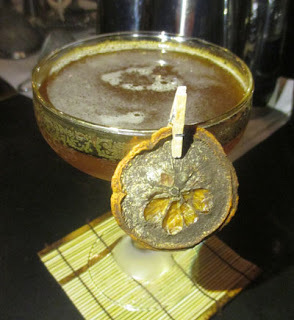 The Gold and Ash greeted the nose with a cinnamon and chocolate aroma both from the drink's ingredients and from the spice dusting on the dried orange wheel garnish. Next, lime and darker notes from the amaro and chocolate liqueur filled the sip, and the swallow offered the combination of rum, chocolate, and herbal flavors with a cinnamon finish. Although the drink turned a touch sweet especially as it warmed up, it was a delightful Winter-feeling Daiquiri perfect for the season. Blend with 6 oz crushed ice, pour into a tall glass, and garnish with a lime wheel and mint sprig. After seeing some blog traffic from a Reddit thread about the Missionary's Downfall, I decided to riff on that drink idea before my mint patch bid adieu for the season. Using the modified recipe from Beachbum Berry's Latitude 29 as a base, instead of the peach liqueur, I thought that passion fruit syrup might perform rather well with the lime and pineapple here. Moreover, the combination of honey and passion fruit was one that worked superbly in the Don's Special Daiquiri. While the original called for a lighter flavored rum, I opted for a grassy and funky agricole and supplemented the flavors with a smoky mezcal akin to the Miracles Take Longer. Given the pineapple and other South Pacific flavors, I changed the downfall aspect to honor the last queen of Hawaii, Lili'uokalani, for in 1893 American sugar cane planters staged a coup that ended the Hawaiian monarchy. The Lili'uokalani's Downfall shared mint, lime, and tropical aromas from the passion fruit and pineapple. Next, lime and honey with hints of pineapple on the sip transitioned to grassy, smokey, honey, and passion fruit flavors on the swallow with a mint finish. Stir with ice, strain into a cocktail coupe, and garnish with a cherry. Two Mondays ago, I was flipping through New York Cocktails in order to find the evening's nightcap. The one that stood out was Brian Teoh's Blood, Lust, and Diamonds that he created at Jakewalk, and the name reminded me of Trina's Starlite Lounge's Power, Corruption, and Lies. Instead of a New Order song title, Brian dubbed the drink after a quote from the early 17th century dramatist John Webster who wrote, "Whether we fall by ambition, blood, or wit, like diamonds, we are cut with our own dust." 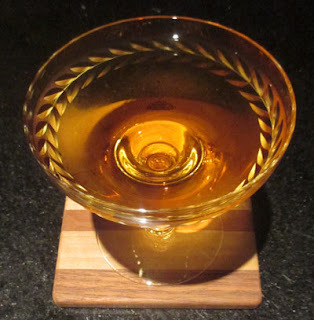 In the glass, the touch of amaretto added a nuttiness to the rye nose. Next, a grape sip led into whiskey, Cognac, vanilla, clove, and almond flavors. Shake with ice and strain into a rocks glass. Two Sundays ago, Andrea and I stopped into Deep Ellum in Allston. One of the drinks we ordered was the Bitter Pineapple Daiquiri that seemed to merge the Jungle Bird with a classic Daiquiri, and it reminded me of Brick & Mortar's Jets to Brazil. 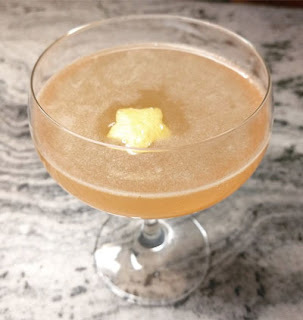 In the glass, this Daiquiri gave forth a pineapple and lime bouquet to the nose. Next, lime with hints of tropical notes filled the sip, and the swallow continued on with pineapple, rum, and bitter orange flavors to yield a rather complex but pleasing profile. 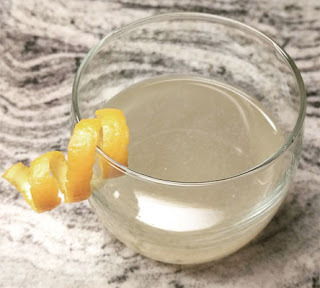 Stir with ice, strain into a Nick & Nora glass (coupe), and garnish with a lemon twist. 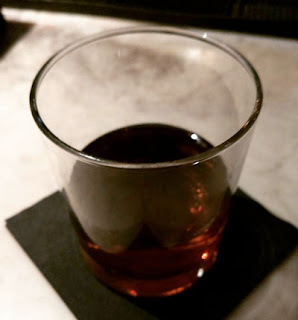 Two Saturdays ago, I was perusing the BarNotes app when I spotted a curious drink by Nicholas Jarrett called the Rook Racked that he crafted at Brooklyn's Dram in 2011. With Bonal, Cognac, and absinthe, it reminded me of the Quinquina Cocktail, but with the additional herbal elements from gin and kümmel instead of fruit ones, it reminded me of some of the drinks in Beta Cocktails. Once prepared, the Rook Racked offered up a lemon oil aroma over anise and caraway notes. 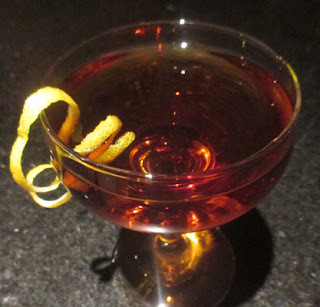 Next, a grape sip gave way to brandy, juniper, caraway, and cumin flavors on the swallow with an anise finish. 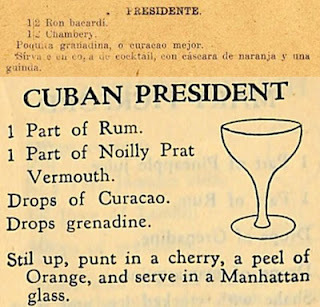 Two Fridays ago, I spotted an intriguing old tequila recipe that did not come from the mysterious pamphlet "Popular Cocktails of The Rio Grande" but from the British 1937 Café Royal Cocktail Book. This drink called the Rio Grande paired gin and tequila which are two spirits that I do not believe that I have had together in the same glass. Could they work? Perhaps not in a convincing way with a London Dry Gin, but what about a more vegetal Western style one? The one I selected was Hendrick's for I felt that its cucumber notes might complement the agave flavors decently. The Rio Grande began with a cucumber-vegetal nose that had almost minty notes to it. Next, a grape sip led into a vegetal swallow with mint and sage flavors. Andrea comment about the drink was that it had a "dry, desert herbalness like the Rio Grande." After viewing the putative earliest recipe for the Alaska in Jack Straub's 1913 Manual of Mixed Drinks on the EUVS site, I began perusing this book for other cocktail ideas. One that popped out to me was the aperitif-style Guggenheim Cocktail which was different from the one in Pioneers of Mixing at Elite Bars. Once prepared, this Guggenheim began with an orange aroma with light menthol notes. Next, a crisp white wine sip led into herbal and orange flavors with a menthol finish. Shake with ice, strain into a Highball glass with 8-9 oz of Ithaca Flower Power IPA. 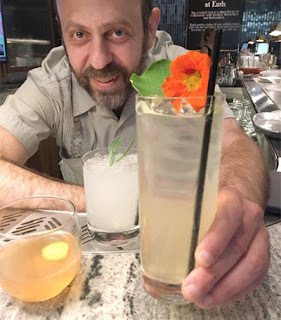 Two Wednesdays ago, I stopped into Green Street and asked bartender Zoard Wells Tyeklar for the A Few Dollars More from the smaller cocktail menu. Since IPA-style beers work well with tequila such as in the End of Days and the Zimmermann Telegram, I was excited to give this one a try. Once prepared, the A Few Dollars More offered an orange aroma that preceded a citrus and malt sip. Next, tequila mingled with grapefruit, orange, and lime notes on the swallow with a bitter hops finish. Stir with ice, strain into a cocktail glass, and garnish with a wide orange peel swath. For the cocktail hour two Tuesdays ago, I decided to make a recipe that I had spotted on the BarNotes app called Brotherly Advice. The drink was crafted by Peter Bodenheimer, the app's creator, who began working on a rum and Madeira cocktail. The name stemmed from his needing help to round out the ingredients, so he asked his brother Neal who co-owns The Cure and Cane & Table in New Orleans. In the end, the Verdelho Madeira's chocolate undertones (as described in this post on Madeira) were accented by crème de cacao; moreover, orange flavors are complementary to many Madeiras so I can understand the orange liqueur and bitters added here. The garnish's orange oil aromas accented the sweet grape notes on the nose. Next, a semi-dry caramel and grape sip led into a rum, chocolate, and orange swallow with a spice-laden finish. Shake with ice, strain into a rocks glass, fill with ice, and garnish with a lemon twist. (*) Add 6 oz sugar and 6 oz water to a pot, bring to a boil, and add 1 banana cut into 10 pieces. Simmer covered. After 5 minutes, cut each piece into half, and simmer covered 5 more minutes. Turn off heat, cut each piece in half, cover again, let cool, and strain. This is more of a flavored syrup than a sweetened purée. To round out my Anais Nin menu at the Cocktail Lab at Earl's in the Prudential Center, I decided on making a banana syrup. 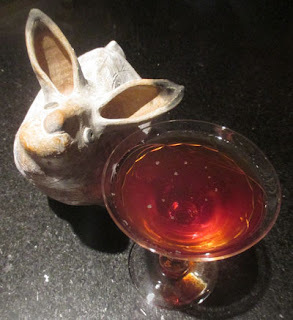 Since banana worked rather well with Scotch in the Holy Molé!, I took the drink in that direction. Moreover, since banana and caramel and winter spice from an amaro worked well in drinks like the Freak C'est Chic, I supplemented the flavors here with Jagermeister and Angostura Bitters. For a name, I selected Anais' Artists and Models. Shake with ice, strain into a glass, and garnish with an orange twist. (*) Steep 4 tsp lychee-black tea leaves in 8 oz boiling water for 5 minutes. Strain and dissolve in an equal volume of sugar. The tea can be found in decent Asian supermarkets such as Reliable Market in Union Square, Somerville, MA, or on Amazon such as this one (same brand I used). 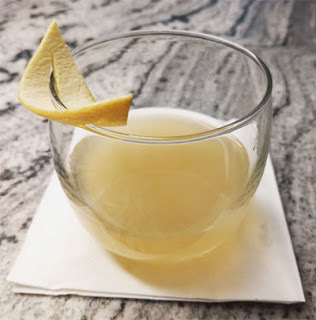 For my second drink at the Cocktail Lab at Earl's Prudential, I wanted to utilize an unique tropical tea that I found at a local Asian market that combined lychee flavor and black tea. To bolster the fruitiness and round out the tea and tropical notes, I added Cointreau to the mix, and balanced the syrup and liqueur's sweetness with lemon. 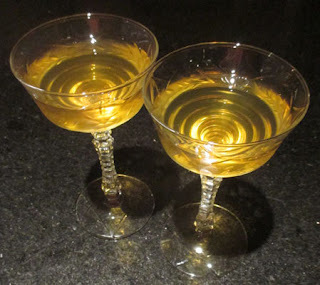 After trying a few spirits, gin seemed to allow the tea syrup flavors to shine through the best. For a name, I continued on with my Anais Nin theme and opted for her novella Spy in the House of Love. Shake with ice, strain into a cocktail coupe with 1 1/2 oz soda water, and garnish with a lemon twist. (*) Steep 4 tsp roasted green tea in 8 oz boiling hot water for 5 minutes. Strain and mix with an equal volume of sugar. 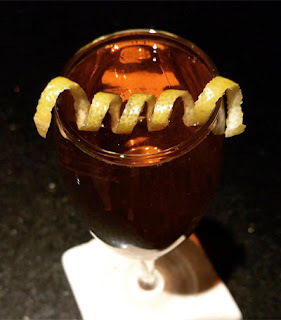 For my fifth and final night at Earl's Cocktail Lab at the Prudential Center, I decided upon a literary tribute to author Anais Nin via a trio of drinks on the menu. The first was inspired by the Fascination Street, a punch I had made three weeks prior. I kept the Cognac, tea syrup, and lemon juice elements but split the spirit with aged rum and swapped the jasmine tea for a roasted green one. And instead of guava jelly, I added some brighter notes from elderflower liqueur to counter to the darker ones offered by the tea change as well as some soda water to lighten the body. For a name, I opted for the story The Basque and Bijou from Delta of Venus. Build in a Collins glass, fill with crushed ice, and swizzle to mix and chill. Garnish with a mint sprig and a lime slice-cherry flag (mint sprig only). (*) Jasper's Basic Stock Mix: Stir to dissolve 12 oz sugar in 16 oz lime juice. Add 1 oz Angostura Bitters and 1 heaping tsp freshly grated nutmeg. Refrigerate. Shake before using. I made a scaled down version of this mix. Two Sundays ago, I spotted a mention of Jasper's Rum Punch and recalled that I had never tried this drink before. 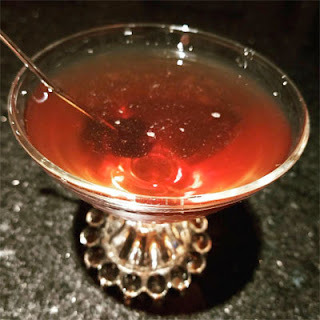 Therefore, I hunted down the recipe and backstory from a combination of Ted Haigh's Vintage Spirits and Forgotten Cocktails and Jeff Berry's Potions of the Caribbean. Haigh regaled how rum collector Stephen Remsberg in 1972 acquired the recipe from Jasper Le Franc who had created both the mix and the punch as the lead bartender at the Bay Roc Hotel in Jamaica. The recipe for the mix in Berry's book was more precise, so I ended up going with that one. 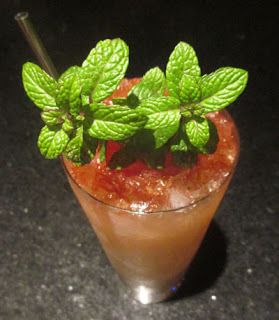 The punch provided a mint aroma over Jamaican rum notes. Next, lime with a caramel-like element from the bitters filled the sip, and the swallow offered funky rum flavors accented with a lot of spice. Shake with ice and strain into a glass; I added a lemon twist and freshly grated nutmeg as garnish. Two Saturdays ago, I turned to Pioneers of Mixing at Elite Bars: 1903-1933 to uncover the evening's libation. There, I spotted the Hudson that had elements of sangaree and punch, so I decided to give it a go. Once prepared, the Hudson offered up lemon, grape, and nutmeg aromas to the nose. Next, lemon and grape on the sip gave way to Cognac and funky rum on the swallow with a grape finish. 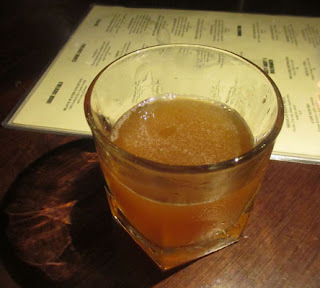 Overall, the combination reminded me of the Chicago as well as the St. Charles Avenue Punch. Stir with ice, strain into a cocktail glass, and garnish with a cherry and an orange twist. The El Presidente became quite popular here in Boston around a decade ago as a combination of light rum, dry vermouth, curaçao, and a touch of grenadine. This is the way I have always made the drink, although I have not returned to the combination in years. It seemed to work for my palate and others including the night I mixed them at a friend's house using their recently acquired stash of Havana Club 3 Year. In 2012, David Wondrich in Imbibe Magazine declared that the drink recipe was first recorded as containing "Chambery" which probably meant the blanc or sweet-white vermouth that the region was famous for. For my recipe, I tracked down the 1924 Manual del Cantinero via EUVS that Wondrich referred to as well as the 1932 Sloppy Joe's Bar book via EUVS that included both the curaçao and the grenadine modifiers (the 1924 recipe had an option for one or the other). The latter recipe declared the drink a dry vermouth one (Noilly Prat is best known for their dry vermouth and appears to have never made a blanc style) as do most of the rest of the recipes to follow with the former one only suggesting at blanc vermouth. Since many people have touted the blanc vermouth version as superior, I merged the 1924 recipe with the liqueur and syrup combination from the 1932 recipe. In the glass, the El Presidente gave forth an aged rum aroma with a hint of orange fruitiness. Next, a sweet white grape paired with the rum's caramel note, and the swallow continued on with rum, orange, berry, and floral flavors. Overall, this combination was a touch too sweet for me so perhaps upping the rum (or using a rougher spirit) and toning down on the blanc vermouth might work. In Pioneers of Mixing at Elite Bars: 1903-1933, they recommend subbing in a rhum agricole for any call of Bacardi during this era to better mimic its grassiness, so perhaps using an overly smooth rum is indeed a detriment here (as is the case in the Twelve Mile Limit from the same era). Moreover, this sweetness could have also been due to the lack of structure imparted by dry vermouth's acid (such as from Noilly Prat), so it came across as a bit more flabby than the recipe I am more familiar with; perhaps this might be effected by my Dolin Blanc bottle not being the freshest (despite it working well recently in other recipes). After Thanksgiving dinner, I was in the mood for a digestif cocktail, and I recalled that there was a Fernet Branca recipe on the Bittermens webpage. That drink was the Second Sip which reminded me a bit of an embittered Chancellor or a less floral Skyfall. The provided history was that Avery and Janet Glasser of the Bittermens challenged Brian Miller at Death & Co. to come up with a cocktail with Scotch, their bitters, and Fernet Branca, and this was the result. Once prepared, the Second Sip gave forth a peat smoke nose with hints of Fernet's menthol. 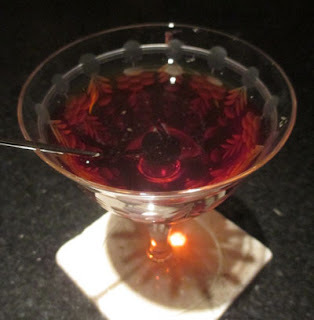 Next, a rich grape sip from the vermouth and port led into a smoky whisky and bitter herbal swallow with a chocolate-menthol finish. Shake with ice, strain into a rocks glass, fill with crushed ice, and garnish with a paper umbrella. Two Wednesdays ago, I ended up on the Kronan Swedish Punsch website where there were a few suggested recipes. 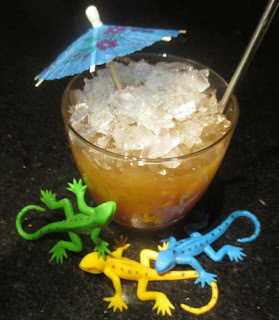 The one that called out to me was the Haole's Downfall crafted by Nick Feather at San Francisco's Restaurant Skool. The ingredient listed as "guava" might have meant guava juice or concentrate (guava syrup would probably be too sweet here given the Swedish punsch and simple syrup already in the recipe), but I had some melted guava jelly left over from the Fascination Street that I figured would work well here. Once prepared, the Haole's Downfall gave forth rum and darker tropical notes perhaps from a combination of the guava and Swedish punsch. Next, lime and caramel were joined by viscosity from the guava's pectin on the sip, and the swallow shared rum, guava, and Swedish punsch's tea and funk flavors. 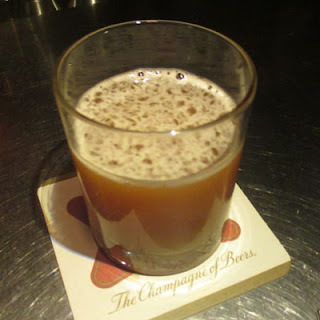 (*) Cloudy apple cider boiled down (perhaps by a third to a half) with cinnamon and clove. Dissolve an equal part of sugar and let cool. Two Tuesdays ago, Andrea and I had dinner at Trina's Starlite Lounge. For a first drink, I asked bartender Kevin McNally for the Clermont that seemed like an interesting riff on the Stone Fence. 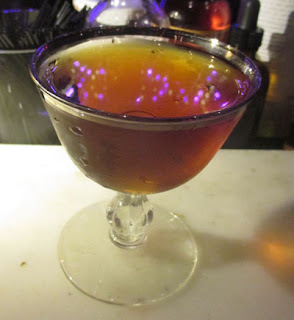 I later asked bartender Isaac Sussman about the syrup, but I regret now not asking about the drink's name. If it were made with a Jim Beam whiskey instead of Wild Turkey, the name would make sense due to the Beam distillery's home in Clermont, Kentucky. Regardless, the Clermont greeted the nose with apple and cinnamon aromas. Next, lemon and apple flavors mingled on the sip, and the swallow offered rye and apple notes with a bitter finish. Shake with ice, strain into a rocks glass, add ice, and garnish with a lemon twist. (*) Bake a sweet potato wrapped in tin foil for 45 minutes at 400°F. Let cool, chop, and blend with 6 oz water. Strain through a tea towel with a squeeze at the end, and dissolve an equal part of sugar into this liquid. In the same Trader Joe's shopping adventure that I purchased the persimmons, I also selected some sweet potatoes for my night at the Earl's Cocktail Lab. I ended up baking two of them: one of them for dinner that night and the other to make syrup the next day. Again, a quick Google search at the store confirmed that sweet potato plays well in cocktails and provided ideas on how to transform them into syrup. Given the roasted vegetal notes, my mind thought that Scotch would work well here; moreover, I added some Cynar to complement both ingredients as well as some lemon juice to balance the sweetness here. The syrup ended up slightly "gritty" with sweet potato particulate, so I opted for serving this on the rocks to hide the light starchy silt. For a name, I dubbed this one Something Must Break in keeping with the Joy Division theme. (*) Two persimmon sliced and added to a pot with 1 cup of sugar and 1 cup of water. Bring to a boil, simmer covered 20 minutes, let cool, blend, and strain through a tea towel. While shopping at Trader Joe's in preparation for my Cocktail Lab night at Earl's Prudential two weeks ago, I spotted the display of persimmons and thought that this fruit's melon and peach notes would work rather well in a drink. A quick Google search confirmed that the idea was a sound one and also provided me hints on how to transform it into a syrup. 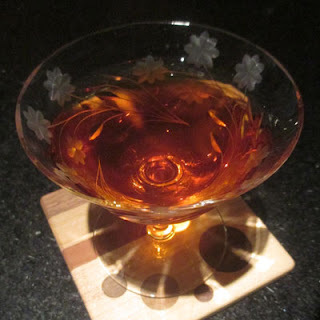 Once the syrup was prepared, my mind quickly went to the earthy notes in pisco, and I thought about supplementing the fruit aspect with either Aperol or Amaro Montenegro. Montenegro ended up adding more complementary notes as well as a delightful citrus-herbal complexity to the mix. 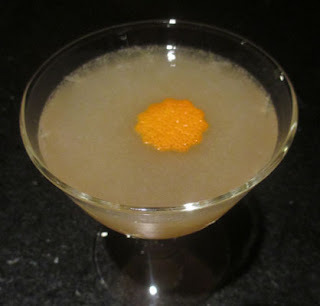 For a name, I kept with the Joy Division song title theme and went with New Dawn Fades given how persimmons reminded me of the color of a rising or setting sun, and I garnished with a moon sliver-esque orange twist. Shake with ice, strain into a cocktail coupe with 1 oz soda water, and garnish with a grapefruit twist. (*) Celery stalks chopped and blended with a little water (2 oz for a medium head). The fine strained juice was mixed with an equal volume of sugar and stirred to dissolve without heat. Two Mondays ago was my fourth Cocktail Lab night at Earl's Prudential out of the five week series. For a theme, I went with songs from the band Joy Division. One of the ingredients that I was tinkering with was a celery syrup made from the stalk's juice; the two drinks that inspired me here were Chez Henri's Lamplighter that utilized celery juice and simple syrup in a Bourbon Sour and Drink's Means of Preservation that paired celery bitters and St. Germain. Since celery bitters go rather well with agave distillates, I selected mezcal as the base and lime as the citrus to balance out the sugar content of the celery syrup and elderflower liqueur. Also to help lighten things up and fill up the larger than normal coupes at the bar, I added soda water to the mix. Keeping the Means of Preservation in mind, the Joy Division song A Means to an End seemed quite appropriate. Shake with ice, strain into a glass with 1 oz soda water, fill with ice, and add a mint sprig. For the cocktail hour on Sunday night two weeks ago, I pulled out my copy of Tom Sandham's World's Best Cocktails and found the section on punch compiled by Al Sotack then of Philadelphia's Franklin Mortgage & Investment Co. From those recipes, I selected Sotack's Palaver Punch that seemed to merge a Dry Martini with citrus and spice elements of a more classic punch. The Palaver Punch met the senses with a minty aroma. Next, a carbonated sip matched caramel-molasses notes from the brown sugar with citrus ones from the grapefruit and lemon juices, and finally, the swallow proffered botanical flavors from the gin and allspice liqueur with a citrussy finish. 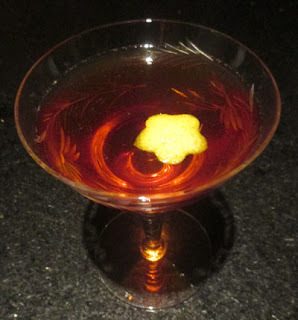 Two Saturdays ago, I searched through the Brooklyn Bartender book for a nightcap. There, I uncovered Tyler Caffall's Lucky Wireless as his riff on the Marconi Wireless that he crafted at Fort Defiance. Since I only have one sweet vermouth at home, I combined the two volumes and utilized my medium bodied Cocchi Vermouth di Torino to span the range between the called for Carpano Antica and Cinzano. Once prepared, the Lucky Wireless offered lemon oil aromas over rum notes on the nose. Next, grape and barrel-aged caramel flavors filled the sip, and the swallow elegantly paired aged rum and brandy with an allspice finish. Blend with a handful of ice and pour (shake with ice and strain) into a cocktail glass containing a Spanish comb ice shell. Two Fridays ago, I reached for Beachbum Berry's Sippin' Safari to find a use for some leftover freshly squeezed lime juice. 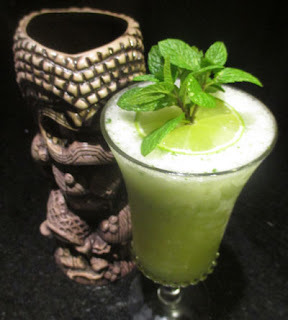 There, I decided upon the Derby Daiquiri crafted by Mariano Licudine at the Mai-Kai circa 1959, and I set about crushing ice, crafting the ice shell garnish, and solidifying it in the freezer. Once the garnish was set, I continued on with the drink which was essentially a regular Daiquiri with orange juice in the mix. 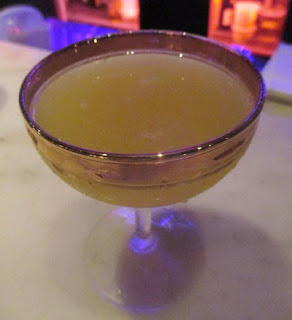 In the glass, the Derby Daiquiri gave forth a rum aroma with hints of orange and lime. Next, orange dominated the sip, and the swallow displayed the rum along with a crisp lime finish.